The Data Management Plan or Data Management Plan (WMD) is a methodological document that describes the life cycle of the data collected, generated and processed during a research project, a doctoral thesis, etc. More and more funding entities like theH2020 i the State Plan They require the researchers to prepare a WMD. What data will be obtained to develop research. How they will be collected and processed. Which standards and what methodology will be followed? Who will be able to access the data. How to preserve when the search ends. The WMD is a living document, which is produced at the beginning of a search and is updated as many times as necessary. You have the free tool Research Data Management Plan with templates adapted to the requirements of each funding entity (H2020, ERC, State Plan) and the type of research you carry out (research project, doctoral thesis, etc.). The tool allows you to save, edit and export your WMD, work collaboratively with other researchers and update it during the different phases of your search. Contains help and examples in all sections. To create a DMP you can also check the guide Data management plans. Libraries offer you support in the creation of your data management plan, in the publication of data in open access, in their preservation in UPCommons and in the citation of data. 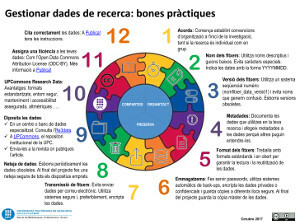 For the good management of your research data, follow the steps of the computer graphics Manage research data: good practices. How to publish data in open access?